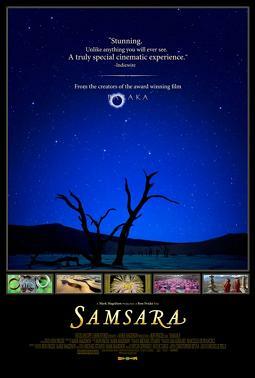 Oscilloscope Laboratories releases Samsara on August 24th, 2012 at the Landmark Sunshine Cinema. Ron Fricke: That’s an intuitive process. It’s what we bring to the experience we’ve had and we structured the film and its content. It’s using imagery that rises to a level of visual interest that’s related to the themes of the film. NYC MOVIE GURU: What about the balance between light and dark elements? RF: We wanted to show both sides so that there´d be a lot of texture in the film. Like, for example, Olivier De Sagazon, the French performer with the clay--that was about showing the shadow side of things and parts of you that you really don´t want to show other people. He did it in a performance. So he was interesting to watch yet there was something brutal about it. We tried to show everything as interestingly and as beautifully as we could even though it was very provocative. And some of those images are the most powerful when they get off what we call "the flow"--- when that flow gets interrupted. You have animals in cages and people in cells and jails and walls that surround religions and dolls that replicate humans. The film is about a flow. NYC MOVIE GURU: What you consider Samsara to be a cautionary tale about mankind’s self-destruction and abuse of nature? RF: I think we´re also trying to show the other side, that there are ways for humans to transform themselves. It´s all out there. It´s what you're placing your value on, and what you choose to do. NYC MOVIE GURU: Where on the spectrum of pessimism and optimism would you say you are? Mark Magidson: The experience of watching the film leads you to feelings of that subject matter that’s maybe separate from the film, but traveling to so many places and seeing just the daunting level of poverty that exists in the world. It’s overwhelming in a lot of places that you see and feel that, and that´s somewhat transformative. You feel a deep sense of compassion for the human condition. RF: My basic frame of reference is that we’re spiritual beings whether we know it or not. MM: I think that there’s a yearning for a sense of connection and we hope that that's what this film ignites and that people feel: a sense of connection to the phenomenon of life in a non-judgmental way about what’s going on around them. NYC MOVIE GURU: What line of dialogue would you introduce into the film if you were to have that option? MM: I´d love to give you an answer if I could. If you're looking for one word that would sum it up, I don´t think I can give it to you because I think that this is an experience that´s meant to be an inner feeling kind of experience. It’s very hard to come up with a word that could replace five years of effort on a ninety-minute movie. NYC MOVIE GURU: How has the advancement of filmmaking technology affected you since your last film, Baraka? RF: We’re a little more fearless now when we go out to work because we’ve done this a few times. There are new film stocks, higher grain stock and new software programs available which gave us an edge. Since there is no main character or dialogue in the film, image really is the main character. So, we wanted to work with 65, 70-mm because the fidelity, the essence that you can get in that image is what we’re after. NYC MOVIE GURU: What was it like to edit the film without music or a script? RF: We chose a Zen approach: no background sounds, no music. We just let the images help guide what we were doing and find a flow. They really will begin to tell you, "Well, I like to be here” or “I don't like to be there." This is how we would form a block of a little bit of content and then we would form another one, and later we were able to string the blocks together and begin to see the film appear. It's not as easy as it looks because when you put two, three, four images together, they want to say something, either about this that's good or bad or some kind of comment on it. And we tried to steer it away from that, just keep it down the middle -- the flow -- so we could just take you on this guided meditation. MM: The imagery, because it’s nonfiction, has a power. You have to get to know the totality of all the imagery that you have when you're done filming and feel how that works together. So we do these blocks, but there are ways these blocks connect together that you couldn´t have written ahead of time because it's about the reality of the imagery that you bring back. So the editing process is intuitive that way. NYC MOVIE GURU: Why did you decide to cut from the image of a Himba tribeswoman to an L.A. freeway? MM: Part of the reason that cut worked content-wise is that they're both shot in late afternoon light so the shots match. And then she looks so contemporary when you go to L.A. Her face is so ambiguous even though she's in a very remote part of the Angolan-Namibian border that we had to take two puddle jumper little planes to get way out there. She feels like you could have seen her in L.A. Those are the kinds of cuts you can't plan on. You can't storyboard or script that; you have to be open to it. RF: She has just transported you to another place. She gave us such a great look. NYC MOVIE GURU: Why did you decide to have people staring into the camera in Samsara? RF: Tut's Death Mask set it up. It's just the most beautiful art object you will ever see. His eyes -- it's really eternity he's staring at: your soul. So all of the portraits were staring back at you and into the camera as if we're all connected. That was the idea. It was a theme set up by Tut’s Death Mask in the prologue: birth, death and then rebirth. NYC MOVIE GURU: How do you feel about the pervasiveness of Western culture? RF : There’s a lot of overlapping of culture. I think it’s technology—a lot of countries are not wiring up. They’re using cell phones and they’re not going to bother with the hardwire infrastructure. There’s a cross-cultural fertilization which some people don’t think is a good thing. It is what it is, though. Western culture is somewhat pervasive and something is lost with that, but it’s not something that anybody can stop or control or that’s right or wrong: it just is. The world is changing that way. When you visit some of the tribes that we visited, it’s sad in a way, too, to see that. I had an experience with this one tribe in Ethiopia where a 14-year-old boy wanted my t-shirt for three days. He wanted a Western t-shirt, so finally I gave it to him on the last day of filming. I felt bad giving it to him, but he wanted it and who am I to say that he shouldn’t have it?